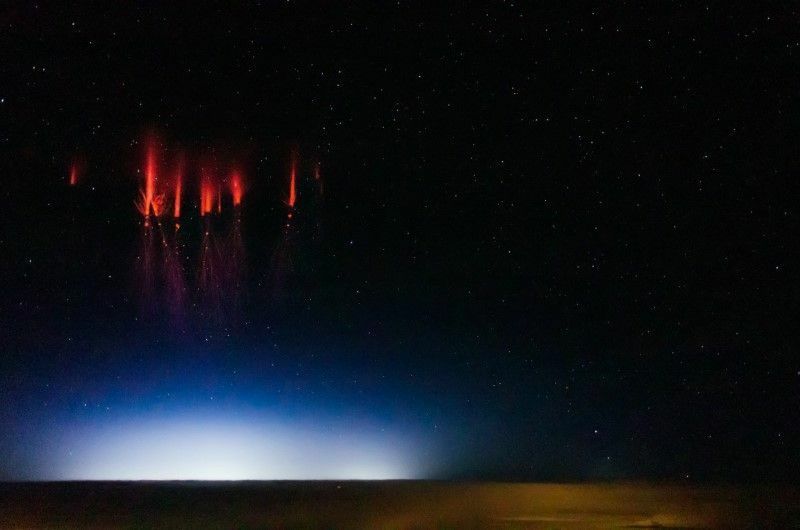 Dubbed red sprites by researchers, these dancing fairies-of-the-clouds are sometimes glimpsed as blood-red bursts of light in the shape of jellyfish. What’s that in the skies? Now baffled researchers asking “What in the world is this?” may have found answers. The brief flashes look like glowing jellyfish, with red bells and purple tentacles. In a single night, a large thunderstorm system can emit up to one hundred sprites. Nielsen, Jason Ahrns, also of the University of Alaska at Fairbanks, Matthew McHarg of the U.S. Air Force Academy and researchers from Fort Lewis College teamed up this summer to study sprites. They used the National Science Foundation (NSF)/National Center for Atmospheric Research Gulfstream-V aircraft, a high-flying plane capable of reaching altitudes of 50,000 feet, to conduct their research. Their project is funded by NSF. They’re also huge, he says, reaching 30 miles high. Blue jets, which weren’t directly part of the scientists’ study, stick around longer than red sprites, originate at the tops of storm clouds, and shoot up to an altitude less than half that of red sprites. Blue jets are narrower than red sprites, and fan out like trumpet-shaped flowers in blue or purple hues. What makes thunderstorms’ celestial lights? Red sprites may happen at the time of positively charged cloud-to-ground lightning strikes, which make up about ten percent of all lightning and are many times more powerful than more common, negatively charged lightning. After a powerful ground strike, the electric field above a thunderstorm may become strengthened to the point that it causes an “electrical breakdown,” an overload that weakens the atmosphere’s resistance to electric current flow. The result is an immense red spark, or sprite, in the atmosphere. Large bursts of gamma rays, emanating from Earth rather than space, originate during thunderstorms, although their exact relationship to red sprites remains unclear. Sprites’ deep red color is caused by the light emitted from nitrogen molecules in the atmosphere, says McHarg. Red sprites may turn out to be important to atmospheric chemistry and global climate by changing concentrations of nitric oxides high in the atmosphere. The researchers are using a technique called high-speed spectroscopy to study sprites’ different colors to determine the amount of energy the sprites carry, and to find out more about their chemical composition. It’s likely, say the scientists, that if watchers wait long enough, they’ll see a red sprite. Blue jets are more elusive. The best viewing would probably come from a plane flying very high, and located miles and miles away from a thunderstorm.